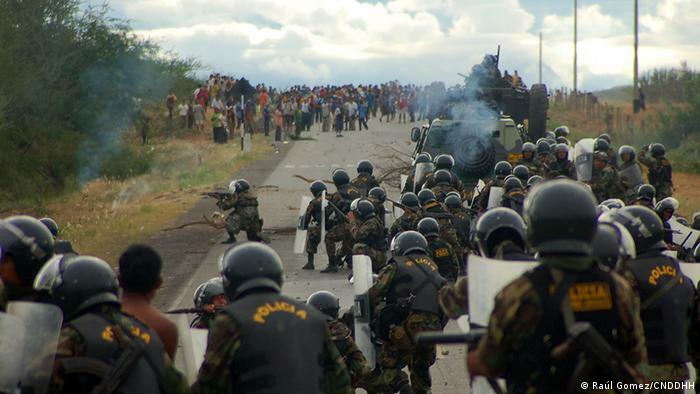 Five years ago, clashes between police and indigenous Peruvians left over 30 dead and 200 wounded. Court cases now underway are showing that Lima's "equality" laws have not yet addressed the gaping de facto disparities. The air in the courtroom is stuffy. It's a hot day in the city of Bagua, a small town in Peru's northern Amazonas province. Ceiling fans, despite rotating at full speed, rapidly lose the battle to heat from the open windows. Despite the stifling heat, additional seating has to be arranged: People have been waiting years for this historic moment. It's the first in a series of court cases investigating fatal events in 2009, when indigenous people of the Awajun and Wampi tribes, together with local residents, demonstrated against government concessions which handed their land to hydrocarbon enterprises. On June 5, an unannounced police crackdown left 33 dead and 200 wounded; one person remains missing to this day. According to an investigation by the Paris-based Worldwide Human Rights Movement (FIDH), the tragedy was avoidable. Protestors had previously announced they would break camp on the day the clashes took place. Dani Lopez of the Awajun tribe was one of 54 arrested after the violence. He was in prison or under house arrest for half a decade, waiting for the trial to begin. "During these five years, the arrest has kept me away from my family, without having committed any offense," Lopez told DW. "Five years away from my children." He knows his youngest daughter, just over four, mostly through pictures and stories from his wife. 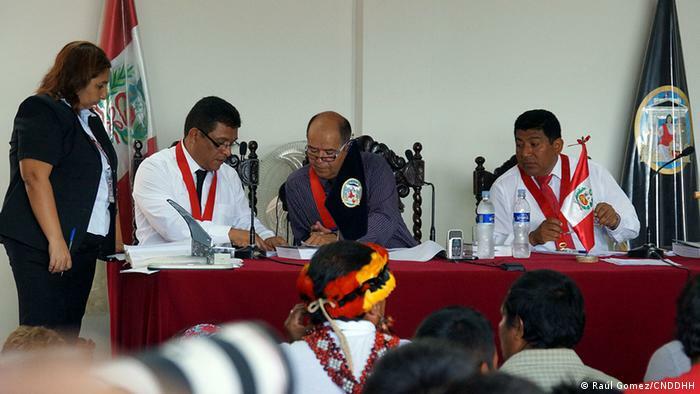 For Merino Trigoso Pinedo, a former Awajun leader and one of the accused, the wait has been infuriating. "The laws say that after 36 months, no citizen, neither indigenous nor other, shall be locked up in confinement," he said. "So who are we? Are we not human beings?" Legally, pre-trial preparations should have been completed within nine months, says Juan Jose Quispe, the lawyer of three of the accused. But due to the sensitivity of the case, he says, it's been handled like a hot potato: Finding a judge to take it on, for example, has proven difficult. Nor, the lawyer added, can his defendants expect remuneration for time lost in jail. "Should he or she in the end be declared innocent, there is no way for that person to ask the state for compensation," he told DW. In general, the trial raises questions about just how equal, exactly, the accused stand before Peruvian law. The policemen involved, Quispe says, were tried in a separate case with no pre-trial detention. 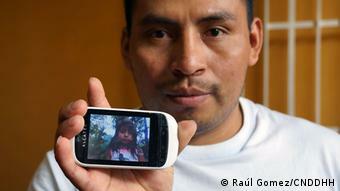 "None are under arrest," he said, adding, "The Peruvian constitution says that before the law all people are the same. Here, this is clearly not the case." Rocio Silva-Santisteban, the secretary to Peru's National Coordinator of Human Rights (CNDDHH), attended the trial's initial session. She remains skeptical about the judge's willingness to proceed with prudence and sensitivity. Even though some of the accused were not native Spanish speakers, for instance, the court failed to provide translators. "In order for this trial to be just, it requires an intercultural perspective," Silva said. "And that doesn't mean to simply provide translator, but taking into account the different parameters and cultural differences of an indigenous people." 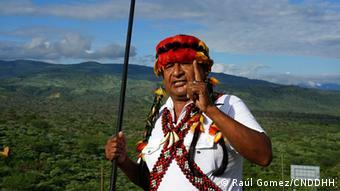 Experts estimate that over 70 percent of Peru's Amazon territories have been licensed to hydrocarbon enterprises. Crude oil and gas production increased by more than a third between 2007 and 2012, according to the Peru's statistics office, with the country's GDP lodging nearly seven percent average annual growth during that period. Mineral exports are also crucial to the economy. In the case of land disputes between multinational oil companies and indigenous people, a study by Duke University showed that numerous concessions were handed out in areas already titled to indigenous people. For years, Marco Arana Zegarra, now head of the leftist Tierra y Dignitad party, has been witnessing the land disputes firsthand. One of the most important steps, he told DW, would be to strengthen the law of "prior consultation." Introduced in 2011, that law was meant to include locals and indigenous people in the decision-making process of where to drill for precious minerals. Since its inception, however, numerous regulations have weakened the law, he says. "These regulations reduce it to a mere act of information, meaning that the state has the indigenous people convene to explain to [the indigenous people] what the project will be," he said. "That's not consultation." Angela Acevedo Huertas, who heads the Peruvian bureau dealing with "prior consultation," says that, despite its flaws, the practice of consulting original land owners has come a long way since the law's inception. "There are sectors that are already working with respect to the indigenous people, such as health or education," she said. "Ideally, each sector would have a dedicated team for this topic, a team who could work on this topic and would have enough practice in this to support us." For Rocio Silva-Santisteban at the human rights coordination office, the trial just getting underway in Bagua offers a chance for long-awaited justice and for the government to improve the situation of human rights in the country - especially when it comes to indigenous people. It will also force many to address the national economic exclusion of those groups - and to confront commonly-held prejudices. "This case is very important for the Peruvian people, in the sense that it shows that there exists a sort of rupture within Peruvian society when it comes to accepting that the indigenous people are a living part of it," she said.